The U.S. Air Force’s third GPS III satellite in production flow at Lockheed Martin’s advanced satellite manufacturing facility here is now fully integrated into a complete space vehicle. 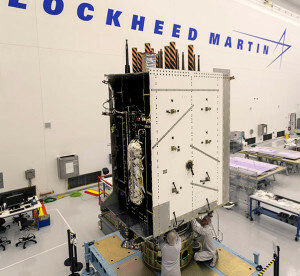 GPS III SV03 was assembled in Lockheed Martin’s GPS III Processing Facility, a $128 million, cleanroom factory designed in a virtual reality environment to drive efficiency and reduce costs in satellite production. Now fully assembled, the third satellite is being prepared to begin environmental testing. GPS III SV03 closely follows the company’s second satellite in production flow. GPS III SV02 completed integration in May, finished acoustic testing in July and moved into thermal vacuum testing in August. The second GPS III satellite is expected to be delivered to the U.S. Air Force in 2018. The fourth GPS III satellite is close behind the third. Lockheed Martin received the navigation payload for GPS III SV04 in October and the payload is now integrated with the space vehicle. The satellite is expected to be integrated into a complete space vehicle in January 2018. In August, Lockheed Martin technicians began major assembly work on GPS III SV05. All of these satellites are following Lockheed Martin’s first GPS III satellite, GPS III SV01, through production flow. 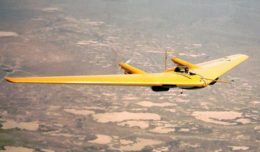 In September, the Air Force accepted and declared GPS III SV01 “Available For Launch,” with launch expected in 2018. Lockheed Martin is under contract for ten next generation GPS III satellites as part of the Air Force’s modernized Global Positioning System. GPS III will have three times better accuracy and up to eight times improved anti-jamming capabilities. Spacecraft life will extend to 15 years, 25 percent longer than the newest GPS satellites on-orbit today. GPS III’s new L1C civil signal also will make it the first GPS satellite to be interoperable with other international global navigation satellite systems. Lockheed Martin’s unique GPS III satellite design includes a flexible, modular architecture that allows for the insertion of new technology as it becomes available in the future or if the Air Force’s mission needs change. Satellites based off this design are already proven compatible with both the Air Force’s next generation Operational Control System (OCX) and the existing GPS constellation.